The single hard hitting hammer in your impact wrench is powerful enough to complete your long list of tasks. But imagine the power when a wrench has a twin hammer? Yes, Husky 1/2 in. Impact Wrench 650 ft.-lbs. has a hard hitting twin hammer that can produce a maximum torque of 650 ft.-lbs. 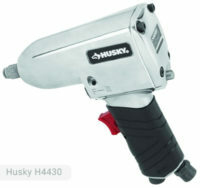 Because of this feature, this Husky impact wrench proves to be very reliable and efficient. This unit has an output of 1,050 impacts per minute. It has a maximum speed of 7500 rpm. With this rate, you can perform different kinds of bolting projects in less than an hour. The recommended operating pressure is at 90 psi. It has a higher air consumption rate (5.0 CFM) than other air tools but it is expected because of its twin hammer. Another distinct feature of this air tool is its internal silencing mechanism which significantly lessens the noise that the tool produces. No need to worry about disturbing the entire neighbourhood. The built-in forward/reverse power management system of the wrench makes the tool easier to control depending on the type of job at hand. The speed and power of the tool can match certain applications such as removing and installing fasteners during auto/recreational vehicle/garden-agricultural equipment/machinery service and repair. It can be used to repair motorbikes without too much hassle. Other applications include struts, motor mounts, and tire rotations. Lug nuts can be removed and installed back with just the right level of tightness. These tasks can be easily done with the punches packed by the impact wrench. 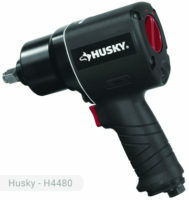 Husky impact wrench H4455 has a low weight composite housing. Because of this, the weight of the tool is also reduced. It weighs only 4.4 lbs. You will feel that the tool is well-balanced upon using it for the first time. For a secure socket retention, the wrench features a ring type retainer. It also has 3 variable power settings making it convenient for the user to make the tool more appropriate with the job. The unit provides a comfortable grip that will let you do your projects with ease. 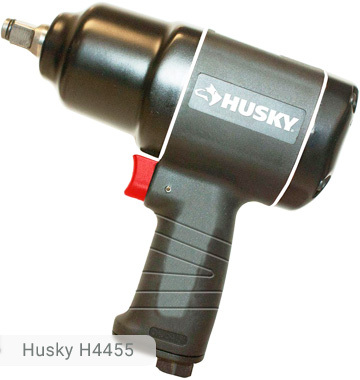 It is recommended to use an air compressor with high storage tank capacity so that it will be able to power the Husky impact wrench for a longer period of time. If you use low capacity ones such as a 12-gallon air compressor, it will still be able to fully power the tool but for a limited time only. Make sure to read the manual for a more detailed instruction regarding this matter. 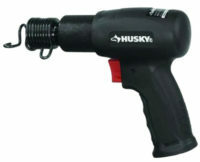 Husky 1/2 in Impact Wrench 650 ft.-lbs. can be purchased at an affordable price of $79.98. The quality of work that it produces is great considering its cheap price. It works very smoothly and quietly that you will not get tired of using it. It is impressively faster than other models in the same class. With Husky, it is not difficult to work like a professional. You should definitely hurry up and try this now. If you already own Husky H4455 model or just want to buy it, feel free to share your review or ask a question through the form below.